Jim, Sheridan, and Paul conducting an inventory of a day’s haul of meteorites. Jim comes up with a number we collected from his field notes, Sheridan removes the meteorites from the collection bag making sure the collected number of meteorites matches the one Jim came up with, and Paul recounts them as he places them into a second labeled bag that get put into coolers. Hello world, Sheridan here. I’ve been on a bit of a blogging hiatus for reasons that don’t particularly need to be explained here. But I am back. Or at least for right now. Our resupply, originally scheduled for January 4th, moved to December 26th, and canceled for 13 days, finally made it to Davis-Ward on January 7th. We had very little propane left and one of the tent groups had to break out the Whisper Lite (a stove/heat source that can run multiple fuel types, in this case we used white gas and tested the use of premix just in case). While we weren’t in dire circumstances, the stress of the continuously canceled resupply and our lack of propane for our stoves did cause some unrest at camp. January 7th was an amazing day for camp. I am sure I speak for everyone when I say that. We took the day off of meteorite hunting to prepare camp. We had to take our broken tents down (recall the wind storm of mid-December), get all of our trash together, and get rid of all unnecessary things so that we can make our trip out of Davis-Ward as light as possible. New tents went up, shrimp, propane, premix, and some birthday gifts (HUGE shoutout to Mike Lotto) were delivered and this incredible weight lifted from all our shoulders. Hosie and Ringo made shrimp scampi, a dish that always reminds me of my last day at Adventure Treks (a 3 week backpacking camp I participated in when I was 14) when we rejoiced in seeing “other” people for the first time in weeks, getting out of our field clothes, and entering into civilization again. Resupply was much like that day at camp for me – we saw new people (the pilot and flight crew), we “showered” (a bird bath of sorts) and changed into new clothes, and we had the luxury of (mostly) unlimited heat again… a whopping 16 tanks of propane were delivered! Yippee! 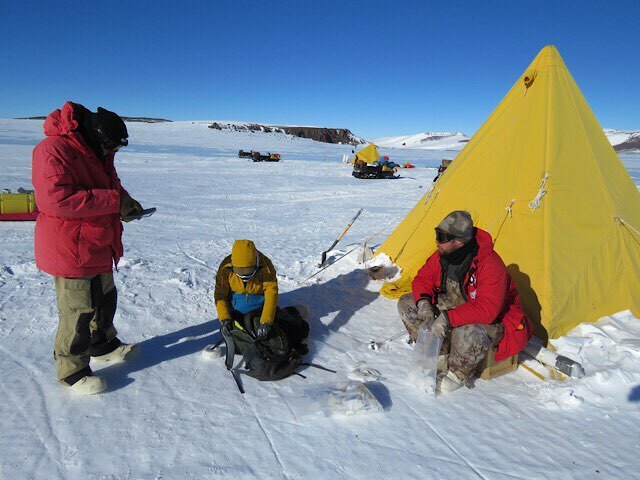 Since January 7th, we’ve worked… worked hard, really… collecting 650 meteorites and flagging others on the ice. I’ve heard the government is shut down and our colleagues back home aren’t able to work. But don’t worry, we still are. We’ve got about another 10 working days here in Davis-Ward if the weather cooperates. We are continuing to do sweeps throughout the ice, search moraines, and conduct reconnaissance around the region for the best places to search. Moral of this blog: we’re alive and well and still working hard to bring back as many space rocks as possible.